The Damascus DSG-100 Imperial Knee and Shin Guards are a hard shell protection system designed for maximum impact resistance and tactical functionality. The high-coverage design includes adjustable and removable footguard plates. 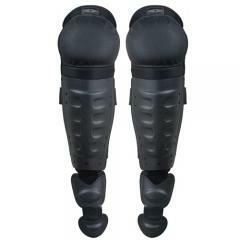 The shin plates and knee caps are made from durable polyethylene in a non-reflective black finish. The knees feature a Trion® non-slip coating, improving stability while kneeling or prone. Beneath the external armor, reinforced foam padding protects against impact and improves comfort. Non-armored sections are made of durable, wear-resistant DuPont Ultra Cordura® nylon, ensuring that the design has no weak points. The multiple, elastic Velcro®-secured straps distribute the load comfortable and provide an adjustable fit to accommodate most.